Last week, the currency pair EURUSD opened with a small gap on almost brown line of the channel, which I wrote last forex forecast. After that the price gap is not closed, and began to move up the brown line of the channel, a bit repulsed by the level of 38.2% Fibonacci retracement of the last downward move last Friday, then the price still bounced on the level of 61.8% Fibonacci and the same again — Brown channel line and broke through the green upward trend line, closed the gap this week and closed below the green trend line, with the daily candle closes sale of candles — black with a long tail on top. Price rewrites at least Friday and bounces on the level of 61.8% from the last minimum of the last week, the same level practically coincides with the rising trend line blue. After that the price rises to a level now 61.8% of the downward movement of the last of this week. Fighting off the bottom, but it still breaks now formed an orange trend line, it tests the top-down and on this day rose candle is now back up reversal candle. Price bounces from orange trend line up and rewriting most of the last day is set down again to retest a broken orange line. After the retest, the price rises again up and at the same time we have already formed a symmetrical triangle, hence the sample and closing the candle above one of the lines of the triangle, presumably, will set the trend and the next movement. Day locked in the center of this triangle of white candles of uncertainty. Price ranges of the triangle and in the evening there is a breakdown it up, but as the candle closes below the upper limit of his own, then this test is wrong. 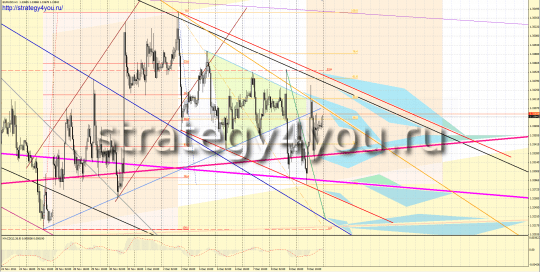 Price approaches the lower boundary of the triangle and the next candle breaks it down, with the price encounters resistance at first dark pink trend line (long term) and then descends to the resistance of 3 lines: magenta long-term trend line, the orange trend line + red line channel (a line drawn parallel to the upper boundary of the triangle). Price bounces up and a little shy of a broken line retest of the triangle (blue line) drops below the price and the daily candle closes above the dark pink trend line of candles sold. Price did not have lasted up to retest the triangle and down again to dark pink trend line and test it from the top down and broke, the price drops again to purple trend line, rewrites at least Thursday + comes to the line downstream of the red channel, the MACD divergence forms and price again rises above the trend line of dark pink, with hourly candle closes above the red trend line drawn through the last highs. There is a retest of its top-down and the price rises up and meets resistance only on the top line of the triangle, the hourly candle closes closes while below it. 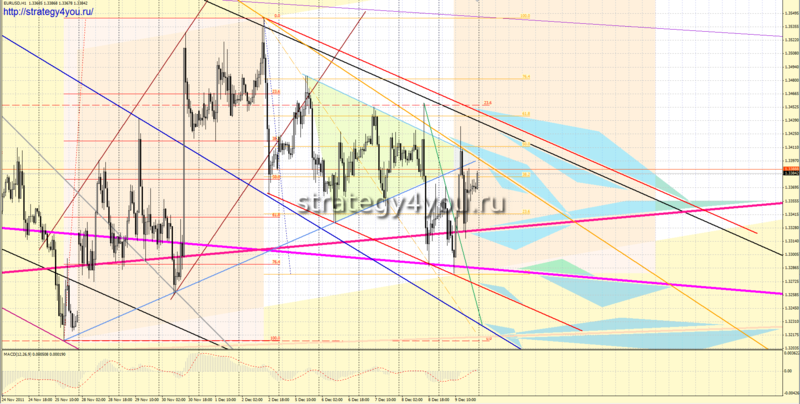 Price falls again to the dark pink red trendline. Again, hang up and closing daily candle on the top middle of the range on Friday. Candle daily closed candle lights out on important levels, candle white color. Week closed with a large black candle tail bottom, just lights out from long-term trend lines. In principle, the situation with weekly candles more prone to shopping, but considering the previous candle, we have a zone bounded by 2-tailed: up and down and likely breakdown of the zone and give some movement in one direction. This forex forecast will also not be the most complete, only to determine the important levels of resistance, and then I think is most traders, who take care of my intelligence on this site know what and how, how to enter the market, as out of it, especially since many are already trained on my video course «Safe forex» and understand the basics and the laws under consideration forex strategy! 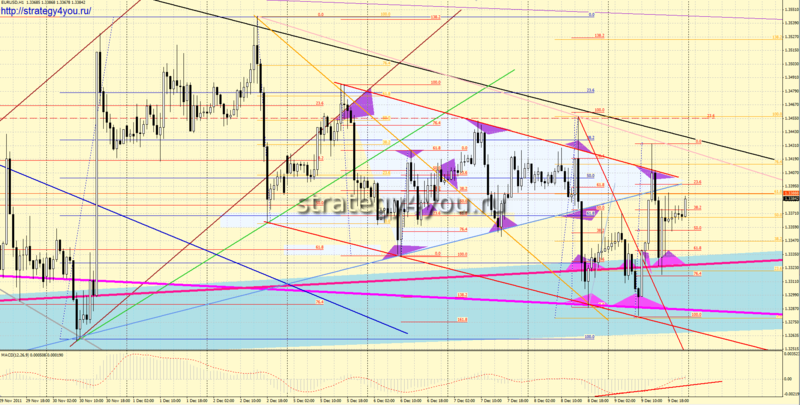 If we look at the price movement from 25 November 2011, the price actually traded in the uplink channel, the adjustment of white, and in fact we can assume that we have generated a wave of OA and AB, and if there is no minimum census of last week, the price and will continue in the near future time traffic in this channel up and the next resistance point even more important — the opposite line of the same white channel, but rather where a purpose — 1.36-1.3605. Down trying to get long-term price trend line 3 times this week and was never able to. 1) For confident purchase price is sufficient to break and close daily candle above our black channel (but now the red line of the channel to the maximum of the last week). Purchase above these trend lines, it is better at retest them away! Stop-loss is a black line + preferably under important Fibonacci level of the last upward movement. Profit is described. 2) You can also consider the option of shopping by closing the candle above the orange line of the trend, but an important resistance level, the black line of the channel (upper) — 1.3443 (61.8% Fibonacci of the last adjustment), if the price breaks above the black line up — see item (1 — above). Stop-loss is certainly at least a dark pink long-term trendline. If the price goes lower and daily candle closes below the purple line of the long channel, then buy the first one through lines below to — retest purple line! Below do not consider the levels of resistance, as they have already been considered in previous forecasts forex this site! Accordingly, the same as the profits to buy. 2) The sale of the black line of the channel (top) with fear (!) — 1.3443-up possible breakdown. The immediate objective of profit — the orange line the channel, if we break through it, then — dark pink trend line, then purple, red line the channel, the blue trend line + light pink. 3) Sales as an option on the orange line of the trend — a stop above the black, dark pink (even better when it retest the bottom up) — stop above the orange, purple below — stop above the dark pink. As for me, I lean more to buying next week, unless of course the price is not closed below the minimum daily candle last week, why — described above! You decide for yourself on what you sell, and the signals from any level to open, and so do not forget to specify new terms and resistance levels during the week! 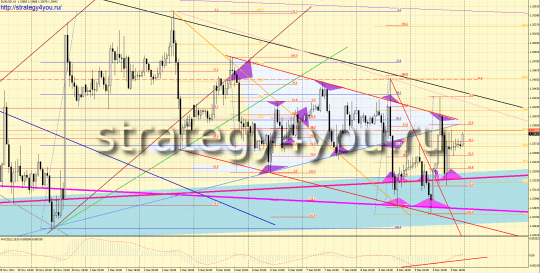 Comments (1) on "Forex forecast EURUSD (12-16 December 2011)"